Region: This beetle can be found in the central United States and eastern North America. Life cycle: The beetle overwinters as a larvae and produces only one generation each year. 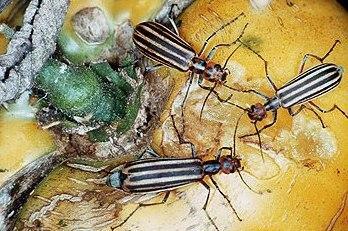 Physical Description: This 1/2 inch long beetle is yellow with black stripes, a black striped head, and black legs. The cylindrical eggs are laid in cells in the soil just beneath the surface. The larva is yellow to white with darker later instars. Feeding characteristics: The adult beetle will eat foliage and fruit, while the larvae feed on grasshopper eggs. Controls: handpicking the beetle is sufficient control, but wear gloves. A harmful substance is secreted from this beetle that can cause blisters. You can protect your plants with mosquito netting. For serious infestations, dust with sabadilla.